A major consequence of the increase in worldwide temperatures resulting from greenhouse gas increases is a potential rise in sea level due to thermal expansion of ocean water and melting ice caps and mountain glaciers. Islands are more exposed to climate change repercussions due to their elevation, restricted land area, the proximity of the majority of people, tourism, and commercial/industrial activity near coasts, and dependence on coastal fisheries and reef resources. Current climate models have predicted that the sea level may rise by 23 to 43 centimeters and average temperature by 0.9 to 1.3 degrees centigrade as soon as the year 2050. 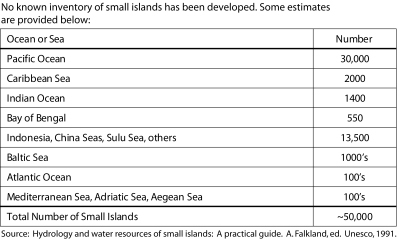 Economic consequences to some islands will be severe, from impacts including inundation, storm surge, shoreline erosion, intensified weather events such as cyclones and droughts, failures of subsistence crops and coastal fisheries, freshwater quality and quantity loss from coastal inundation and salt-water intrusion, degradation of coral reefs, and the increase in conditions that spread diseases such as malaria and dengue fever. These effects are proportionally large on the finite resources of island nations. Data analyses were conducted to predict the influence of relative sea level such as on Tangier Island, located in the middle of the Chesapeake Bay, VA. The island is one of only two that continue to be inhabited in the Bay. The increased sea level will accelerate shoreline erosion, as slowly erode away the entire island over this century.